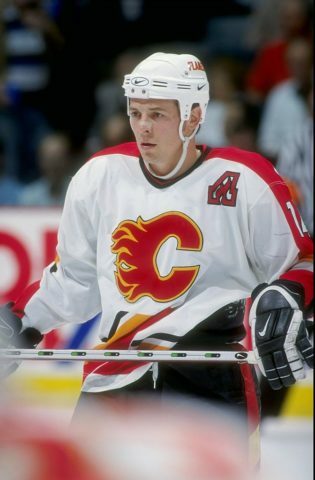 The NHL has changed a fair bit since Theoren Fleury last laced up skates and even more so since he first donned a Calgary Flames sweater. Best known for his small size and large personality, he was an anomaly during his playing days. In an era that featured some of the biggest names and also some of the toughest customers in the history of the game, the undersized Fleury managed a successful career. It wasn’t until he hung up his skates for good that revelations came to light about what truly fueled the Flames legend. It is through these revelations that Fleury now champions multiple initiatives to help victims of addiction, abuse and childhood trauma. At 5-foot-6 and 182 pounds, Fleury was bluntly told he was too small to play pro, yet he clawed his way into the NHL with his skill and relentless determination. Drafted by Calgary in 1987, Fleury spent 11 seasons with the Flames, from 1988-1999, captaining the club for two seasons (1995-1997). He recorded 34 points in 36 games during his rookie campaign in 1988-89 and hoisted the Stanley Cup at the end of that season. He remains the second highest scorer in franchise history, with 830 points (364 goals, 466 assists) in 791 career games. Fleury eventually moved on from Calgary to join the Colorado Avalanche at the tail end of the 1998-99 season, where he appeared in 15 games. The next three seasons were spent under the bright lights of Broadway, as Fleury entered into the twilight of his professional hockey career. He tallied 69 goals and 132 assists in 224 games with the New York Rangers from 1999-2002. His final year with the Rangers also featured an Olympic appearance in Salt Lake City, Utah. As a member of Canada’s elite national team, built by Wayne Gretzky, an emotional Fleury stood front and center as the country captured it’s first gold medal in men’s hockey since 1952. When the NHL’s crackdown on obstruction was announced in 2002, the league slowly transitioned from a more lenient attitude towards interference, hooking, holding, clutching and grabbing. The changes soon ushered in a surge of smaller sized, fleet-footed, skilled players who thrived under the new system. In 2018, Flames fans cheer on Johnny Gaudreau, but before ‘Johnny Hockey’, there was ‘Theo’. Without the type of ‘told-ya-so’ trailblazing that Fleury prompted throughout his career, we may not have seen the evolution of hockey to where it is today, with the dazzling display of skill from Gaudreau, Patrick Kane, or Brad Marchand. When asked about the era of hockey he played in and whether he would have appreciated some of the rule changes that benefit smaller players in today’s game, Fleury was quick to defend the good ol’ days. Unfortunately, Fleury’s NHL career came to an unceremonious end. He was playing for the Chicago Blackhawks in 2002-03 when recurring issues with substance abuse and alcoholism led to his ‘indefinite suspension’ from the league after 54 games with the Blackhawks. Six years later, Fleury staged an exciting, albeit brief, comeback appearance with the Calgary Flames during the 2008-09 preseason, but officially retired following the tryout. NHL rule changes enabled the rise of smaller, skilled players in today’s game and it’s worth noting that while the league has evolved over time, so too has Fleury. In 2009, Fleury released a biography titled Playing With Fire which shared a candid look into his tumultuous life of success and excess during his 16-year hockey career. 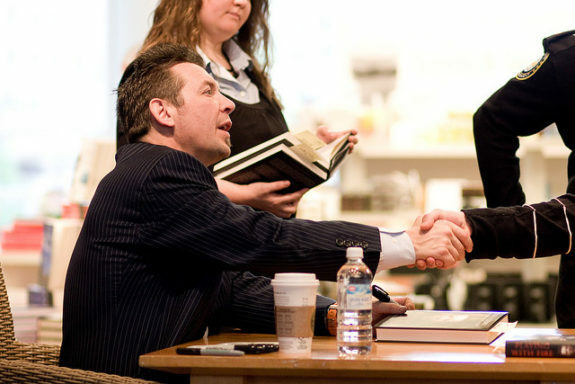 The book was co-written by Kirstie McLellan Day and quickly became a bestseller. Not only did the book paint the picture of a day in the life of an NHL star, but it also revealed the trauma the kid from Oxbow, SK suffered as a child and the resulting addiction and substance abuse issues that followed him throughout his career. It was a time of topsy-turvy emotions throughout the writing, editing, and publishing of such an intimate account. But the process became almost therapeutic for Fleury, who revealed more and more about his life, recording the details of his past into the pages of the book. When he initially met with McLellan Day about co-authoring his biography, the goal was to focus on Fleury the hockey player, and nothing else. It was a searing moment for Fleury, who remembers the moment vividly. Fleury’s journey continues with multiple programs created to help raise awareness and support victims of childhood trauma. One of those initiatives annually walks across select Canadian provinces to help spread a message of hope. He’s a hockey player, an author, a singer/songwriter and now an activist. Theo Fleury is actively involved in developing ways to help those who have suffered traumatic childhood experiences. As a public speaker, he makes appearances on television and radio, at schools and local events across Canada offering a message of hope for recovery. The goal is to create awareness and share the necessary information with those who desperately need it. Powered by an Orange Wave of Courage, a movement has been started across the country to lift the stigmas about childhood trauma, mental health and addiction. The Victor Walk and its accompanying documentary are just two of the initiatives Fleury spearheaded in 2013 to help spread the word. In its fifth year, the July 2018 edition of the Victor Walk strolled confidently through Alberta, Canada, with participants stopping in Fort McMurray, Lac Labiche, Cold Lake, Drumheller, Medicine Hat and Calgary. It was reportedly the most well-attended walk to-date. The Breaking Free Foundation, which facilitates the Victor Walk, is an online initiative founded by Fleury to help support the survivors of abuse. It offers a grant program which makes therapy affordable and accessible to those who need it, as well as a Meet Up initiative that encourages people to speak up, providing a safe place for them to tell their stories. The Meet Up program is credited with saving multiple lives and continues to inspire Fleury and his team to build on what they’ve started. Fleury played 1,084 games in the NHL, scoring 1,088 points (455 goals and 633 assists) and added 1,840 penalty minutes. He is 64th in all-time scoring in the NHL, as well as a Stanley Cup champion and an Olympic gold medalist. But his most important accomplishments have to do with the people whose lives are being transformed by his story.